I'm really digging this song. It's called Photograph by Ed Sheeran (in case the link ever breaks). It's obviously not the most original song title nor would you guess that was the title from the lyrics but it is an appropriate title nonetheless. It makes me think of Freshman Year at NMSU and Kimberly. And Michelle. And the heartbreaks we caused each other. When I got home from college, I never really talked much about my time in Kirksville, mostly because to back fill in all the necessary details would have required reliving it and I was still going through my own version of PTSD. I was really ill-prepared for college and serious relationships and I paid the price. When I first started blogging, it never occurred to me to mine those stories from college for content because I was working under the early paradigm of blogs = online journals going forward, not backward. I certainly wasn't going to re-read all my personal journals either. By the time blogs arrived, I had finally worked through all the drama, angst and pain of college and replaced it with the drama, angst and pain of my 30s still trying to figure things out. Speaking of NMSU, I found this in a box of old stuff at my mom's house last summer. 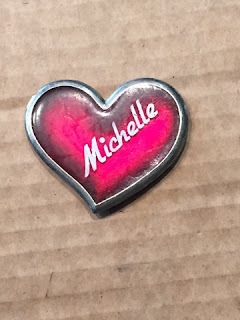 It was given to me by Michelle. She was a blonde haired, blue eyed sorority girl. The prototype girl that I would meet many more times in life but never quite understand why this type liked me but the brunettes I chased after didn't. Michelle was a hot mess in need of more therapy and love then she could ever hope to receive. Kimberly broke my heart, and I broke Michelle's. Something changed somewhere during my time at NMSU. When I first arrived I had confidence and the ability to win Kimberly over and steal Michelle from a guy named Jeff. But by the end of my time there I lost my confidence. One thing that comes to mind is that the majority of the people I hung around with freshmen year were gone from my circle (and even campus) sophomore year. I still saw a few people but most of my time was spent with Alpha Phi Omega. I think what I'm trying to say is that about the time that I lost/stored away this pendant, is about the time I struggled with getting girlfriends. It's like I forgot how much someone once was into me, and that it could ever happen again. Obviously I found the power somewhere else.